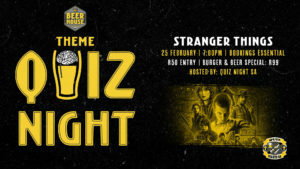 Are you ready to break your brain with the Beerhouse and Quiz Nights SA Crew? Think you are the ultimate Stranger Things fangirl or boy? Show off your sci-fi skills at our next themed quiz night. Grab our epic R99 special, choose any of our burgers (except #gees burger) paired with a 330ml Devil’s Peak Brewing Company Lager or a soft drink. When you book your tickets online you will automatically have a table reserved for your team.